Samoa never used any kinds of flags to represent their nation, till the first Europeans set foot on the islands. The first flags were flown in Samoa only in the 1800s. Due to the contest of Germany, the UK and the USA over the islands, the islands were divided between them in 1899 and the borders were agreed at the Tripartite Convention. The United States took control over eastern half of Samoa. American flag was raised in American Samoa on April 27, 1900 and it was considered as its official flag till 1960. In 1960, the Samoans adopted a new flag, that is still in use today. The flag consists of a red-edged white triangle, dark blue upper and lower triangles and a bald eagle clutching a war club and fly-whisk. 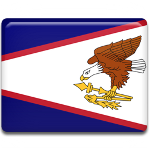 The flag of American Samoa carries numerous symbols. Blue, white and red represent the colors, traditionally utilized by both the USA and Samoa. The bald eagle also represents the USA, although this bird doesn't live in American Samoa. War club represents the government’s power and a fly-whist represents the wisdom of traditional Samoan leaders.